Back in April, a group of anonymous “guerrilla activists” in Seattle installed plastic bollards on a bike lane that traverses underneath an interstate highway. The group who dubs themselves the “Reasonably Polite Seattleites” wanted to show Seattle’s Department of Transportation how easy it is to improve safety for bicyclists on existing infrastructure with just $350 worth of materials. “The posts that you installed on Cherry Street will be removed and I am sorry about that. The posts are 36 inches high and is higher than most road bicycle handle bars. A rider can hit the post with their handle bar, which is a safety concern. Over the next few months, the Seattle Department of Transportation followed up by installing plastic bollards on that very bike lane, and went further by extending the bike lane to connect the network of bike lanes downtown. They made good on their promise to improve the situation. I have good news to share. 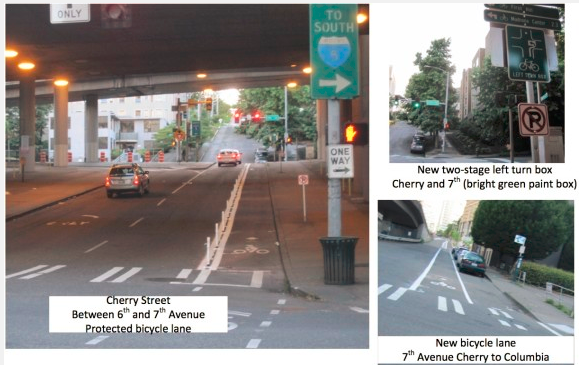 SDOT worked with WSDOT to reinstall your thoughtful protector treatment on Cherry Street. SDOT and WSDOT agreed to monitor the installation to determine if additional changes need to be made. We also took this unique opportunity to make additional improvements. We installed a two stage left turn box on 7th Avenue for left turning bicycle riders who may not feel comfortable riding with car traffic, new bicycle lanes on 7th Avenue between Cherry and Marion, and bicycle lane on Marion Street between 7th and 8th Avenue. What a wonderful example of how polite, civil disobedience can precipitate a constructive dialog that can lead to positive change. Two years ago, after a pregnant Toronto mother was killed on her bicycle by a large truck, we created our own guerrilla bike lane made out of trash to illustrate how drivers will respect the space allocated to bicyclists. Read the full Trashy Bike Lane article here. Sadly, the bicycle markings that were illegally painted above were removed by the city, and that intersection – where Jenna Morrison was killed – is still lacking any bicycle markings or infrastructure almost two years later. So the polite folks in Seattle have had much better luck than we have had here in Toronto. Dongho ChangDongho Chang. (I especially love that Dongho offered to leave their plastic posts somewhere so they can collect them.) The R.P.S. went about their protest very respectfully and patiently (admittedly more so than most of us might have been); they really are polite! I’m happy to have such a great group of undercover transit heroes in Seattle as well as a city engineer who is equally reasonably polite.